The Best Corned Beef Dinner. Ever. 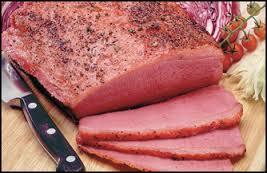 St. Patrick’s Day is approaching and many people will celebrate with the traditional corned beef and cabbage dinner. But there’s another good reason, beyond tradition, for having that fare: smart shopping. All the supermarkets have advertised sales on corned beef this week, so there’s the economical reason for the dinner as well. My wife and I are both Irish-Americans, and though we have corned beef more than once a year, we always have one around St. Patty’s Day. I first started making corned beef this way about 30 years ago, and I haven’t made it any other way since the first time I tasted the result. If you have your own favorite way, fine. But if you’re looking for a foolproof way of preparing the most moist, tender and flavorful corned beef you’ve ever had, try this. I like to buy a larger brisket. You might have to search a little, because most cuts are about 2 ½ to 3 ½ pounds and that’s not big enough for me. I like the piece of meat to be over 4 ½ pounds, 5 or more if I can find one. First remove all wrapping and place the brisket in a crockpot. Add 4 cans of Bud. Don’t get too cute here. Stronger brews and designer malts can impart undesired flavor. Bud works perfectly, and it’s one of the cheaper beers. To this add ½ of a 1.5 ounce jar of McCormick Pickling Spice. Cover, set the temperature to auto/shift and let it cook about 6 hours. At 6 hours stab the meat with a fork. If it is not tender enough raise the temperature to high and continue to cook for 1 more hour. I generally have my meat on by around 10 in the morning. Once it is finished you can let it rest for 20 minutes on a cutting board, or an hour or more on buffet setting in the crockpot. Slice against the grain to desired thickness. Make sure to use a very sharp knife or the super tender meat will shred. In a separate pot bring 6 cups of salted water to a boil. Cut a head of cabbage into eighths (simply halve, halve again into quarters and halve the quarters into eighths) and place in the boiling pot. Cook until tender, about 20 minutes. Place in a serving bowl and sprinkle generously with fresh cracked black pepper. Here’s where I veer from the traditional. I find that plain boiled white potatoes are boring. I need a contrast and I get that with a baked sweet potato. The sweetness of the potato contrasts wonderfully with the saltiness of the meat and cabbage. I microwave the sweets for about 5 minutes, then finish in the oven to crisp the skin. Serve whole allowing guests to mash individually and add butter or your favorite butter substitute. Lagniappe: Corning meat began in the middle ages when there was no refrigeration. It was a means to preserve the meat in barrels over long periods of time. If you buy two or three briskets while they are on sale (for as little as $1.99/lb), you can store them in your refrigerator a long time provided you leave them in their unopened packaging. I’ve kept them as long as 6 months with no noticeable difference.